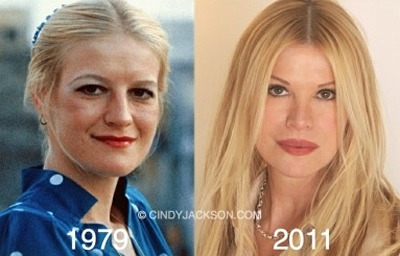 At 55, Cindy Jackson currently holds the Guinness Record for the most plastic surgery, but doesn’t look like a monster at all. She’s just doing what she can to look as young as she feels in size. In 2004, during an interview with CBS, Cindy Jackson admitted she never outgrew her obsession with looking like a Barbie doll. She saud: “I looked at a Barbie doll when I was 6 and said, ‘This is what I want to look like.’” That’s probably what a lot of little girls say, but they eventually grow out of it, which wasn’t the case with Cindy. Growing up as a farm girl in Fremont, Ohio, Cindy recalls she wasn’t very good looking, unlike her sister who was breathtakingly beautiful and always attracted more attention. At 21, she moved to London where among other experiences, she had a short-lived career as a punk rocker. The years went buy, but her childhood obsession with looking like Barbie stuck with her, and at 33, Cindy got her chance to make her dream come true. When her father died, she inherited some money and decided to invest it all in her appearance. She began by having her upper and lower eyelids reshaped to open up her eyes, then moved on to liposuction on her knees and collagen injections. She admits her surgery was pretty extreme, considering she had multiple nose jobs, breast implants, cheekbone reshaping and implants, liposuction and microdermabrasion, but thinks her investment was wise as it allowed her to become a pioneering case study of plastic surgery. She also launched two best-selling books about her experiences, launched her own skin care treatments, traveled the world and got her singing career off the ground. Things were definitely going according to plan for Cindy Jackson, but then in 2007 her mother died and she was left some more money. After 20 years of being called a living Barbie doll, just like she had always dreamed, the plastic surgery addict had finally outgrown her obsession and realized she actually wanted to look like Brigitte Bardot, the famous French icon of the sixties and seventies. So a new wave of plastic surgeries followed. Jocelyn Wildenstein or Pete Burns, who have had fewer interventions look considerably worse. Cindy says her secret lies in taking it slow. She realizes she has had a lot of plastic surgery, but she never overdid it over a short period of time, and that has helped her keep her appearance under control. Jackson estimates all the procedures she had done cost her over $100,000, but judging by the way she looks at 55, I’d say it was money well spent. She may not look perfectly natural, but she really doesn’t look all that bad. Check out her official website to learn more about her.